Joining the Civil Rights Movement to help end segregation and allow African Americans the right to vote, Lynda Blackmon Lowery, born in Selma, Alabama in 1950, was too young to take part in the sit-ins. Instead, she was a "gopher," Her job was to go for help. By the time I was fifteen years old, I had been in jail nine times. The Civil Rights march in Selma took place on Sunday, March 7, 1965; Lynda Blackmon Lowery was only fourteen when she took part in that historic march now called, Bloody Sunday. She was sprayed with tear gas and beaten, but those seven stitches over her eye and twenty-eight in the back of her head did not deter her from joining in march to Montgomery. Dr. King’s march from Selma to Montgomery would show Governor George Wallace and the world that black people still demanded the right to vote—that beatings and violence would not stop us. Lowery would turn fifteen on the second day of the march. Lowery’s memoir is engaging as she recounts her experience being an African-American teenager and an active member in the Civil Rights Movement in Alabama during a very tumultuous time in our country’s history. Her commitment to the movement despite her terror illustrates the tremendous dedication and determination it took for all those involved, both black and white, to win the right for all U.S. citizens to vote. Well-selected historic photos are interspersed throughout the text along with Loughran’s graphic style illustrations. In her author's note, Lowery gives a brief explanation of what historical events lead up to that infamous march from Selma to Montgomery. She also includes brief bios of three who lost their lives days before or after Bloody Sunday. Listen to an interview with Lynda Blackmon Lowery on npr.org. Lowery states: We were determined to do something and we did it. If you are determined, you can overcome your fears, and then you can change the world. Pair this with the graphic novel March. Book One and March. 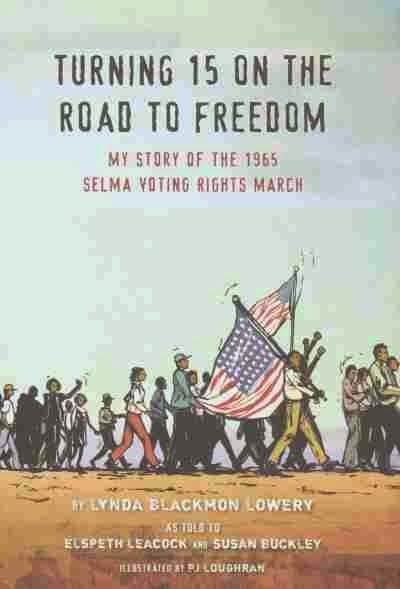 Book Two by John Lewis, Russell Freedman’s Because They Marched: the people's campaign for voting rights that changed America, and Freedom Summer by Susan Goldman Rubin, and BrownGirl Dreaming and The Other Side, both by Jacqueline Woodson. I'm adding this to my "To Read List"! I just reserved this at the library. Thank you for including books to pair it with.